The construction industry is full of breakthroughs and technological improvements. Oftentimes, these advances help to reduce overall costs while improving efficiency and eco-friendliness. 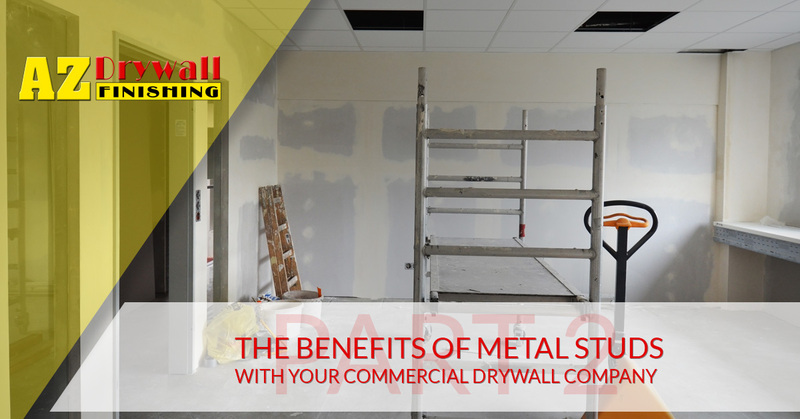 When it comes to commercial drywall, improvements in materials such as metal have helped to provide better results with lower costs. AZ Drywall Finishing is here to serve as your go-to drywall contractors in Chicago, delivering comprehensive services ranging from metal stud framing to wall finishing. Since 1999, our commercial drywall company has worked hard to build a reputation of integrity, precision, and high customer satisfaction. From the first estimate to the grand opening, your business can benefit from our professional drywall installation services! We’re passionate about our craft, and these blog posts allow us to provide educational information for consumers looking for an Illinois drywall company that cares. Today, we’ll continue to discuss the benefits of metal studs over their wooden counterparts. If you are installing drywall for your business, be sure to contact us today to receive a quick and accurate quote! Superior stability. One major steel framing has over wood is its resistance to changes brought from problems, including heavyweight loads and weather. The moisture and humidity of Chicago can cause wood studs to warp or rot over time, creating serious safety concerns for your building’s inhabitants. While wear and tear is a normal part of any building design process, steel studs are made to last. Flawless fire protection. When your framing is comprised of metal, you can expect better protection from fire dangers. If a fire were to break out, the heat and flames will inevitably go through your commercial drywall and reach the studs. Wood studs in this situation will burn, comprising the structure while adding more fuel to the fire. Steel framing, on the other hand, is often touted as the material needed to make a wall nearly fireproof. Termite resistance. Small leaks can sink great ships, and this saying can prove true if your structure is plagued with invasive insects. Eastern subterranean termites can prove to be very damaging to Chicago buildings, with these invasive pests causing more structural damage than natural disasters. If termites begin to consume your wood studs, your building will require costly services to stem the damages and prevent any further issues. Steel framing, on the other hand, is impenetrable to bugs and will not provide the sustenance needed for a colony to thrive. Solid strength. Steel is made to be very strong and ductile, helping to make it the top building material in the world. The strength of this metal makes it superior for most applications, providing structural stability to defend against the harsh elements. Areas that deal with seismic activity or high levels of wind can benefit from cold-formed steel framing and quality installation services for an amazing result. Lower costs. While the price tag for wood framing is lower than metal options in most cases, the overall cost is where steel shines. From minimal warranty issues with problems such as warping and splitting to reduced cleanup costs from removing scrap and debris, using steel for services such as drywall framing can provide a range of cost-saving benefits. Every situation is different, so be sure to find a local commercial drywall company with the experience needed to provide fast, cost-effective results. When you consider all of the pros and cons of each material, it should be easy to see why drywall finishers such as AZ Drywall Finishing utilize metal for all of our projects. Again, every project is unique, and wood studs may be a smarter choice for your project. Wood provides a tried and true method of delivering quality results, yet steel can be used for more versatility and more precise outcomes. Today, more than 40 percent of commercial drywall projects for businesses rely on metal stud framing! If you are in need of professional drywall contractors in Chicago, our team is here and happy to help. For almost 20 years, AZ Drywall Finishing has provided stud framing, commercial drywall installation, acoustical ceilings, and wall finishing services to businesses all across Illinois. We work hard to provide the best, and we’re confident that you’ll love the results. Contact us today for a quick quote!